Slept in until 1 p.m., which feels glorious and much deserved after spending about a week of working from 9 a.m. until 1 a.m. EVERYDAY. Took a nice long shower and actually got sorta gussied up, again much deserved after spending a week in "I-don't-care-what-I-look-like-mode." Went shopping. YES. Feeling better already. Met a fellow blogger (Second Skin) while thrift shopping. So nice meeting you today by the way! Let's make thrifting dates! Finally set up my rolling rack and organized the former pile of clothes on my floor. 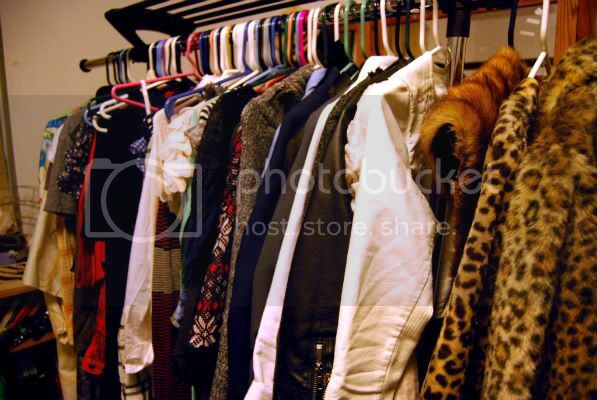 Totally inspired about putting together an outfit tomorrow morning. Speaking of inspiration, I saw "Coco Avant Chanel" yesterday and cannot wait to start finding ways to incorporate little bow ties, straw hats and cropped men's trousers into the daily rotation. Speaking of Coco Chanel, I NEED TO LEARN HOW TO SPEAK FRENCH. ASAP. Yup. 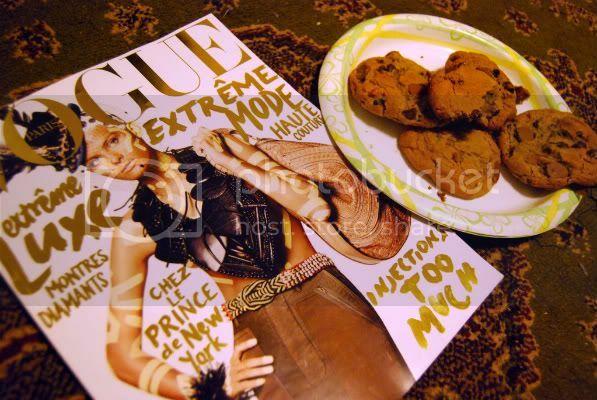 Paris Vogue and cookies. Yum and yum. Happy Sunday everyone! Sounds like a delicious and ambitious endeavor. Good luck! i would like to go shopping with you ^^! I came to a similar conclusion after watching Audrey Tautou in Hors de Prix. I even moved to the French speaking part of Switzerland to learn and travel! She makes it sound so lovely and easy.. but it's such a hard language for anglophiles. Hope your attempt goes smoother than mine! Nice day!! I wish all the days were that much fun. ahh lucky you. i have yet to meet a fellow fashion blogger! i really want to see coco avant chanel. was it good? I stilll haven't seen Coco Avant Chanel, I'm so disappointed in myself. Isabeli is amazing!vogue plus cookies!that's good!! Sounds like a nice relaxing Sunday! Did you find anything interesting while thrifting? If you don't mind telling, where is your rolling rack from? I've been trying desperately to find one thats actually sturdy. my email is bekahhhhh@gmail.com if for some reason you don't want to post it... haha thanks! I was so happy to meet you yesterday! I KNEW you had something going on when I saw you browsing shoes and belts in those amazing Riding BOOTS! I would love to go shopping with you sometime. We might have to do a few rounds of rock paper scissors if you are a shoe size 8, but it would still be fun! paris vogue and cookies sound like a wonderful combo to me! Perfect day in my opinion. I need to get one of those rolling racks. Where do you find them? I'm guessing Walmart or somewhere like that. REFRESHING DAY! What shocked me was the 14 hours a day of WORKING!! Everyday?!? Whoa!! What do you do?